Lady Grace Cavendish is a very young Maid of Honour at the court of Queen Elizabeth I. She is also of the age when she must pick a husband. Grace is not all enthusiastic about this but she has no choice as the Queen has decided that the time has come to make this decision, and as everyone knows, when the Queen has decided on something, the matter is settled. So, a special celebration has been planned during which Grace must choose between three suitors for her hand. She really does not particularly care of any of the three men but she makes her choice, guided by her instincts and by the gifts that the various suitors offer her. Thus it is that Lord Robert Radcliffe is the lucky man, chosen for his youth, his good looks, and for the pearl necklace that he offers Grace as a token of his love. Before Grace has the time to fully appreciate her future, Lord Robert is arrested for the murder of Sir Gerald Worthy. Sir Gerald was one of the three suitors who wanted to marry Grace, the one who turned into a very sore loser when she chose another man. Grace is convinced that Lord Robert is innocent and yet how can she prove it. With the help of Masou the tumbler and Ellie the laundry maid (who are her friends and allies) Grace starts investigating the murder and she soon begins to discover that something decidedly peculiar is going on at the court. 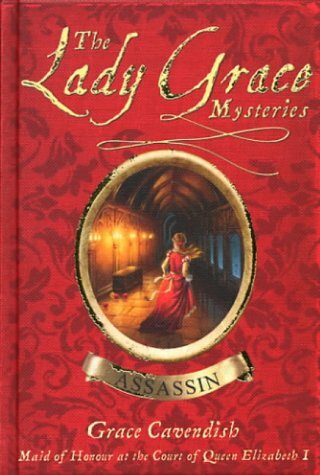 This first of the Lady Grace Cavendish mysteries is gripping, full of fascinating details about the times and the people who lived in them, and superbly researched. Grace's observations about the people who live with her are both fascinating and humorous, as she seems to have the knack of seeing the less visible side of the people's personalities. It is this ability and her deft instinct for suspicious circumstances which make her a perfect candidate for the job of "Lady Pursivant" to Queen Elizabeth I.